Focusing on slots, craps, buffets and drink deals is a natural reaction, but it misses much of what West Wendover, Nev., can be as a getaway destination for Salt Lakers. The area along Interstate 80 that straddles the Utah-Nevada line has stunning natural terrain, terrific outdoor recreation opportunities, entertainment and interesting history. The bright lights of the casinos can blind you to what’s available in the “real” Wendover. There are multiple ways to experience the outdoor beauty of the area, and Intermountain Guide Service (877-882-4386, IntermountainGuideNevada.com) can take you to the peaks that give stunning views of the surrounding valleys, or out onto the incredible Bonneville Salt Flats. The tours run year-round, because while West Wendover has similar temperatures to Salt Lake City, its geography gives it many sunny winter days. Intermountain Guide Service’s “Get Dirty Then Clean House” ATV tours can pick you up at your hotel. The ride takes you through the scenic Leppy Hills—where you’ll possibly see bighorn sheep and wild mustangs—before getting up to the base of Pilot Peak above 10,000 feet to enjoy majestic views in all four directions, including down onto the Salt Flats. There’s also the issue of needing to hose down the undercarriage of your car after you’re done. One way to avoid that—and also have an expert available so you’re not “on your own”—is to take Intermountain Guide Service’s Salt Flats van tour, which includes checking out the racing areas where world land-speed records are regularly set in five different events running between August and October that have either the word “speed” or “world” in the title. Check out LandRacing.com or SaltFlats.com for the schedule. The Goshute Research Site for HawkWatch International (800-726-4295, HawkWatch.org) is about 24 miles out of West Wendover and requires a 2.5-mile hike with 1,800-foot elevation gain to get to. But it’s worth it for the scenery, and when you get to the site, you can learn from on-site volunteers about how more than 55,000 raptors have been banded since 1980 as part of a long-running migration study. You may also get a chance to interact with some birds. Also, check out Blue Lake, about 16 miles south of Wendover, Utah. 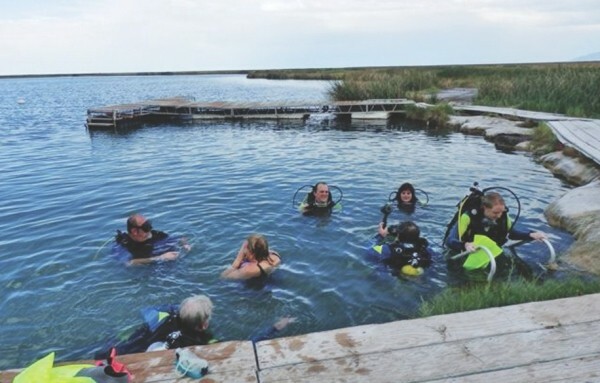 The geothermal lake stays about 72 degrees year-round, and at 60 feet deep, is a great option for scuba divers who want to get their deep-water certification. The area is managed by the BLM and is open to the public. After a day of being in the outdoors, your night doesn’t have to be spent just at the roulette wheel. The Peppermill Concert Hall (680 Wendover Blvd., 800-217-0049, WendoverFun.com) regularly features well-known comedians and musicians in a 1,000-seat theater, where every seat is within 88 feet of the stage. The hotels and casinos also feature their own cabaret-style entertainment. Wendover played a huge role in the history of the 20th century, as the local air base was the training ground for the 509th Composite Group, the commander of which piloted the Enola Gay, the first aircraft in human history to drop an atomic bomb. The Historic Wendover Airfield Museum (345 S. Airport Apron, 435-665-2308, WendoverAirBase.com/museum) gives visitors a chance to learn about and reflect on this monumental moment in history. West Wendover (775-664-3081, WestWendoverCity.com) is also home to the final telephone pole—erected in 1914—that completed the Transcontinental Telephone Connection. It still stands just south of the Montego Bay Resort. The aspect of Wendover history that modern-day Utahns may be most familiar with is Wendover Will, a 90-foot-tall neon cowboy who beckoned cars off the highway from 1952 to 2004. The City of West Wendover has moved him farther west of the state line and to the middle of the road, surrounded by a base, where visitors can walk up and get an up-close look. Wendover is the closest place outside of Utah that really feels like you’re not in Utah anymore, but it’s also a great place to enjoy outdoor recreation, take in some unbelievable scenery, laugh with a comedian, take in a show and brush up on history. Kathleen Curry and Geoff Griffin regularly blog about their treks near and far as the Travel Tramps on CityWeekly.net. They also host the weekly Travel Brigade Radio Show.